Little explorers can collect & catalogue natural treasures with Moulin Roty! A stroll through the outdoors with my garden foraging children always ends in a handful of treasures of the gumnut, leaf and rock kind – the only thing is, what to do with them? The Garden Treasures Box is a great place to start, allowing children to both sort and store their beloved garden finds with this easy system! The Garden Treasures Box by Moulin Roty contains an assortment of labelled drawers for rocks, seeds and feathers (to name a few) plus an envelope to contain their bounty, keeping the collection neat as a pin as well as safe from a vacuum or being accidentally binned. 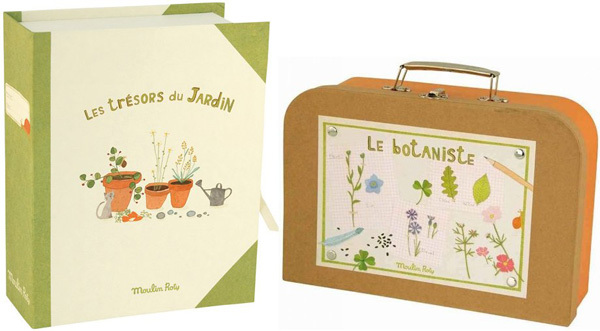 Making the Garden Treasures Box even more charming is its beautiful French script, which I personally think makes it all the more endearing – the illustrations clearly depict what the draw content label is, making it easy for children (whose French language skills might be lacking) to understand. 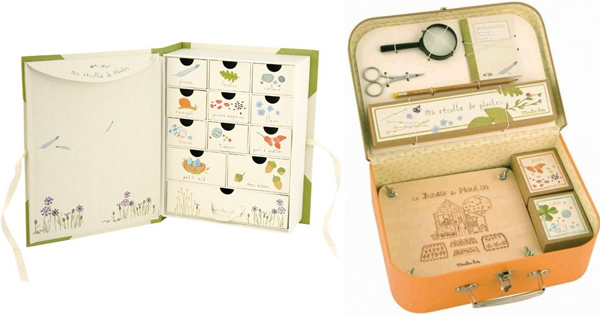 Budding botanists will adore Moulin Roty’s magnificent Botanist Case, a treasure trove itself that’s filled with a magnifying glass, scissors, notebook, pencil and a flower press. Also included are three sweet cardboard collection boxes that allow children to store different seeds or nuts discovered from season to season. Be sure to see our past posts on more beautiful wares from premium French brand Moulin Roty. For your very own Garden Treasures Box, priced $69.95 or Botanist Case priced $99.95, head on over to Entropy.